So we now live on I-94. I had no race car-having sold it for a Civic in some small degree so I could commute safely and cheaply in from the boonies from our farmette. But now my commute was actually half what it was and I live in brand spanking new house on a loopdy-loo street named after I tree that they had cut down to put that street in. I had alot of free energy and I needed a hobby to burn it off. So I attacked our yard with a passion verging on obsession. We moved in on Halloween weekend in 2004. By Thanksgiving we had over 500 sq feet of perennials planted, 9 trees, and 13 shrubs in addition to moving in. Got some wicked good end of season deals. The basic goal was to reduce our need to maintain the lawn as much as possible. The incredibly small yard in West Allis was easily tended to by a push reel mower-and I was committed to not going back to gas. So 30% of the front lawn became perennials and path. 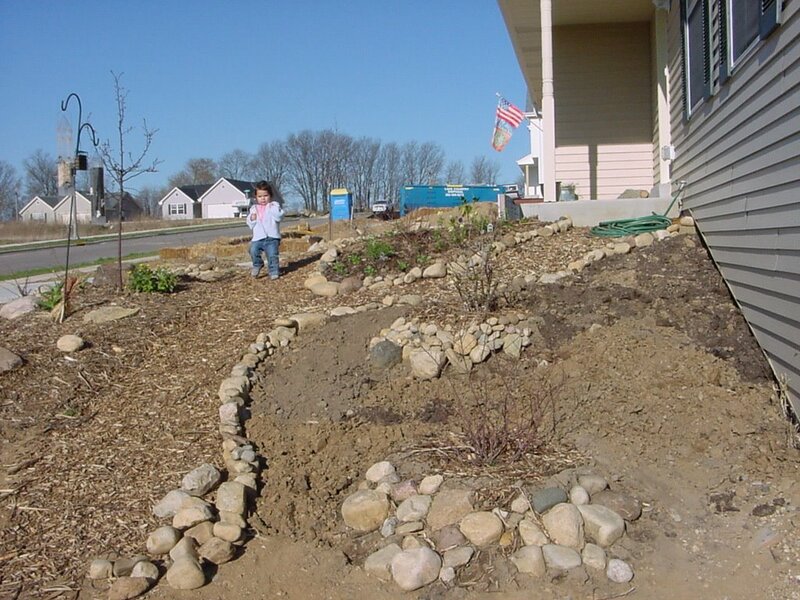 We put in a rain garden with native plantings. And after we discovered a fantastic Organic Farm Supply store 7 miles south of us I tracked down a low maintenance, ‘no mow’ grass seed so I only need to mow the backyard 1-2 times a year for weed control. Excellent. By summer the lawn was mostly done and I switched to food crops. I had spent the good chunk of the winter sending our local librarians scouring the region for obscure books on soft fruit, BioIntensive gardening, food storage, composting, etc. This research led me eventually led me deeper and deeper as I sought to find more ‘essential’ ways to garden-to heal this land and in some way assuage the guilt I felt for living on it. Also, in no small part I wanted to put myself thru some education. If we couldn’t have the farm, but I wasn’t going to let the small fact that we lived in a subdivision keep me from being a farmer. So I kept reading, and scouring the bibliographies to take me further from where gardening is now to where it is going. Or more precisely to where it has been-most of the new gardening techniques are only remembering the thousands of years of method that we forgot in one generation last century. Somewhere along the way the search led me to Permaculture-which was brillant in theory, but to focused on the tropics to be as much help as I needed here. Acacia’s sounded like fantastic trees, but my zone 4 winters begged to differ. Then I found Gaia’s Garden: homescale permaculture for temperate climes. I was All In. I have since bought it and read a passage almost weekly-but back to our tale. In went some apple trees. Then 125 strawberries, a dozen or so raspberries, some blueberries, several currant shrubs, and my crowning achievement: a stand of Sunchokes. 2 raised beds also went in, but with so many balls in the air the soil prep was not as thorough as it deserved. In fact in a blatant violation of Permaculture basics I was building without observing and I got burned. The first big rains of the summer turned a good chunk of my backyard into a river as the unplanted hill drained thru my backyard. My second bed was inundated with a 15′ wide deluge over a foot deep. All my soil amendments and double digging were swept away in an afternoon. Still not one to give up, I tried valiantly to plant it with the Three Sisters, but with no nitrogen the corn only got knee high. Ever. 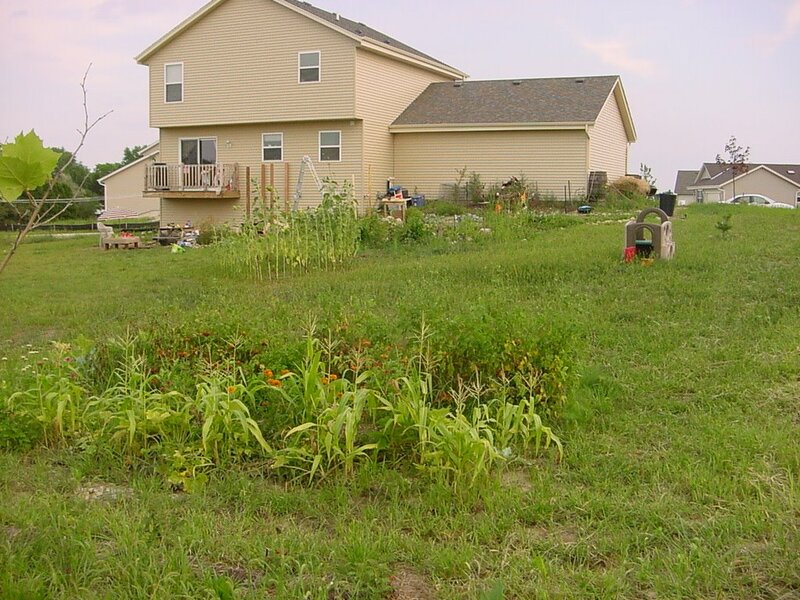 The picture below is testament to how rough it looked: The beans sprawled and yellowed (no innoculant) and in a wonderful lesson in my naivete-I had planted ‘yellow squash’ not knowing it was bush habit so instead of sprawling as a green mulch it merely wrestled with the corn. How many ways did Edison discover how not to make a light bulb? With every misstep I learned more, and the most important lesson-one that can’t be really be learned, only experienced is the patience that comes with gardening. When the deluge washed out weeks of work, there was really no way to start over if I wanted any crop in at all-nature’s cycle moves with or without you. When the corn stalks yellowed I made the conscious choice to change my perspective. I could have saved it- dumped in even organic options like blood meal, but instead I started referring to is as my green manure crop. I wasn’t chagrined that the Sisters would not be visiting in any meaningful way, I was satisfied that I was creating organic matter to be turned in for next year. Permaculture thinks long term-if I had dumped in nitrogen as a thick top dressing I would have jacked up the soil ecosystem-the nitrogen feeders would have had a population explosion feasting on the manure, but as that was spent they would drain the soil of the existing slow release nitrogen that was to feed the corn all summer long-locking me into a fertilizing cycle that makes me work harder and ruining the soil in the long run. My choice of patience saved the soil for this current year-enriching not only the soil but my outlook as well. The first bed was much more of a success story. The soil had started as a chalky brown alternating clay and sand with very low humus levels-it was literally debris from a local gravel pit-coming up from dozens, if not hundreds, of feet below any productive soil strata: I was on a mission. I went to our local coffee shop and asked for their grounds to compost and was very pleased to find them, if anything, more excited than I was that they would be helping reduce their waste. I became the ‘compost guy’-some of the highest praise I have ever received and a badge I wear with pride. All told I produced just shy of 3 cubic yards-almost 100 cubic feet!- of finished compost last year counting the last pile I just spread-pictured is one of dozens of loads I hauled last year. As the compost cooked I, ‘double dug’ the entire bed. No doubt I will devote an entire post to it soon, but I have a strong aversion to using any power tools in my lawn or gardens-so I didn’t rototill even to break the sod. 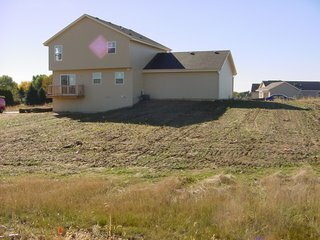 Even though I was only doing 300 sq feet, this was back breaking work for an out of shape suburbanite to accomplish with a spade and fork, but we got it done in less than a week and only several doses of ibuprofen. Even with pulling off the sod (for compost of course! ), with the double digging and the addition of leaves, etc from the city yard, and 500lbs of manure from the hardware store the beds now actually rise almost 8″ in the centers. At this point I did not box them in as a true raised bed (I would rue that decision in about 2 weeks), but let them mound naturally. The first bed was very productive, my heirloom tomatoes (the first I had ever started from seed) were amazing, I had more zucchini than I knew what to do with. Luckily my wife did and we had amazing dishes for weeks, including cupcakes that were off the hook. I planted one cherry tomato plant, but only got one or two as my 2 yr old daughter proved to be a huge fan and picked it clean daily. I was very concerned about plant health with the new beds-that I would be missing nutrients, etc and that the plants would be susceptible to pests. Of course I wasn’t going to spray, but how would I protect my investment? 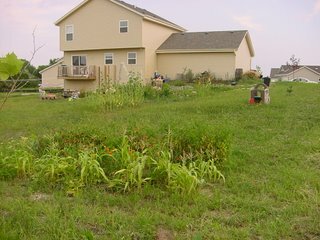 If there was one thing that both the Biointensive Method and Permaculture have in common it is a loathing of monoculture gardens. I attempted to not plant more than a handful of each species in any block-or at least that no block was bigger than 10 sq feet without a break to help keep pest populations in check geographically. Much more importantly I called in some friends. More accurately I built them a house and set the table in hopes that they would show up for dinner and stay for a pest ‘snack’. My friends in this case were parasitic wasps, predatory bugs/spiders, and lady beetles. I lined both gardens with alyssum, cornered them with Fennel and had Zinnia peppered all along the path- not only did this make the gardens more beautiful, and provide cut flowers for the kitchen, but I had pollinators and protectors in abundance-I was stacking functions into the garden and taking my first steps into Permaculture: reducing my inputs and increasing the gardens outputs at the same time! I had no pest issues other than cabbage worms in the broccoli, but later at the Organic Valley fair every organic farmer I talked to called it the worst year they had seen in some time for them so I didn’t take it too hard. Speaking of my friends we had the largest garden spiders I had ever seen-easily 4″ across at the legs with a yellow abdomen. Not poisonous and very beautiful. A favorite activity every day was to visit them with the kids who treated them with all the reverance and wonder that only toddlers can. You’ll never get that in a Diazinon Garden! My dream was becoming reality. -You can overdo even organic fertilizer-I killed all my blueberries with ammonium nitrate as I attempted to lower the PH and add nitrogen- -slow and steady is critical. -Sunflowers-though native to North America, need ALOT of nitrogen if you want them to be any where close to their claimed heights. This should have been patently obvious by the amount of growth I was expecting in one season, but hind sight helps. Cutting the sod and dropping in the seeds doesn’t suffice. -Your children are wiser than you are. They will teach you more than you teach them if you let them. When I looked at my yellow, spindly sunflowers and thought of what could have been-my son and daughter saw a magical forest where beauty grew each day, the sun could dance, and goldfinches could fed their young. Thank the Maker for my children!!! for my Zone 4/5. This year I am planting about 1.5 row feet a week (about 20 radishes). -Pick your battles-we tried to do everything the first year. Most things worked, but there were many disappointments. My gardens and I would both have been happier if I had focused more on fewer projects. That will be the theme this year. What lived once, can live again. So, after puking out all the moto-ness of it all I figure I should throw a bone or two to the other of my manias. Of late that would be gardening. Not really sure where this started-my best guess would be a book that my parents picked up early in my high school years-a book on Yardening. Prior to this book we had always had a large-ish vegetable garden and I have very fond memories of cleaning beans with my mother and walking those same bean rows chasing out the bunnies. This book changed my perspective-shattered my paradigm for how yards were to be maintained-up to this point it was the Scott’s 4 Step program, lots of mowing, and Weed B Gone. This book taught me about more holistic approaches like aerating, adjusting PH, and treating specific diseases-that there were underlying causes to a poorly performing lawn other than lack of water or fertilizer. This was all pretty exciting (remember I am a self proclaimed dork-what well adjusted 14 year old reads gardening books? Dork is a badge I wear with pride-known to many jocks and cheerleaders I guess)-but then I read the next chapter and my life changed forever. 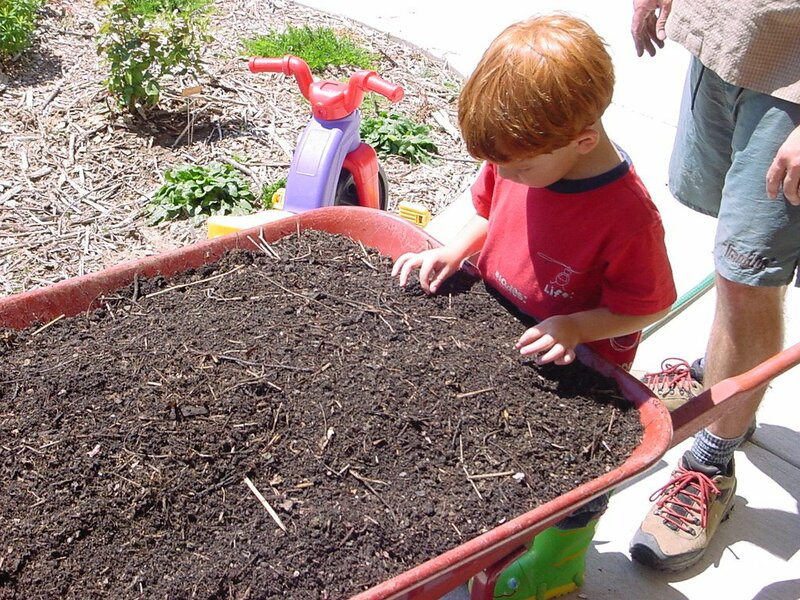 That chapter was Composting. The sheer beauty of the process-nature’s miracles in my own backyard! I somehow convinced my parents to give me $50 to build a bin to the plan in the book and I set out on the journey of a life time. Those first piles were rank-way to much nitrogen as I piled on green grass clippings, but I learned and by the end of high school I had piles so hot you could literally burn yourself on the steel rod I had in the middle to gauge temperature. Looking back I can’t remember ever doing anything with that compost-I am sure my mother used it somewhere-but for me I was an alchemist-making gold from cast off waste. It is said that John Adams, when asked in the sunset of his life what he was most proud of-he mentioned not his dealings founding the US of A-but simply “his manure pile”. I can understand this, but I digress. Shocking-I know. I took off several years-almost 10 infact as I attended school and later rented before I could get back into gardening again. 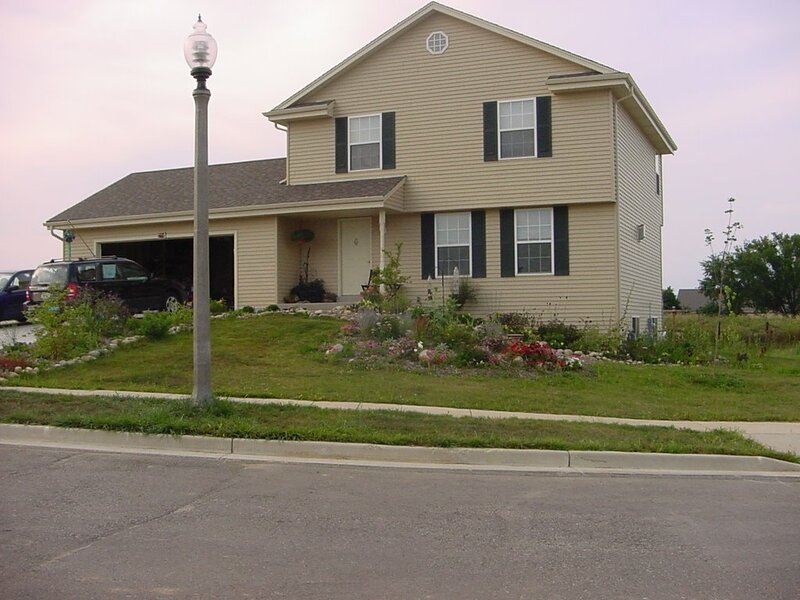 Our first house in West Allis, WI had a very small yard with a very large Black Walnut in the middle, thus I learned quickly the power of alleopathy We only lived in that house for 3 years, but planted several beds-I did the sodbusting and my wife created the beauty. At this point I was embarking on my autoracing hobby so I spent most of my time in the garage, but after far too long I had a compost pile again. Eco it got. Passive Solar. Wind Powered. Probably Straw bale. 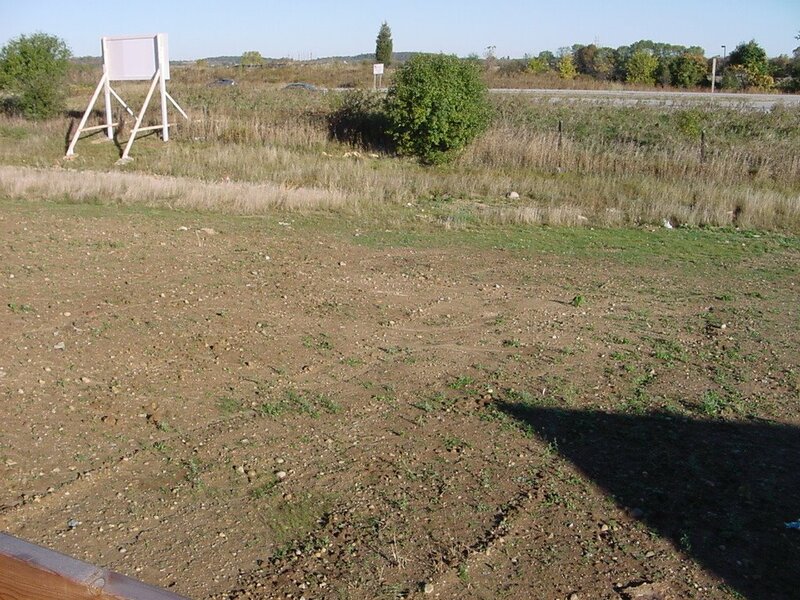 Possibly septic and well free running composting toilets and cisterns. Regardless-it wasn’t in the suburbs of Milwaukee. So we started looking. And looking. And looking. We had one deal fall thru for all the right reasons, none of which made the pill easier to swallow. The land was too small-only an acre. It was too far from work-and everything else. But it was as close as we could get. After that deal went sour the pickings became more and more grim-and our house had already been sold-we needed to get into a new house very soon. 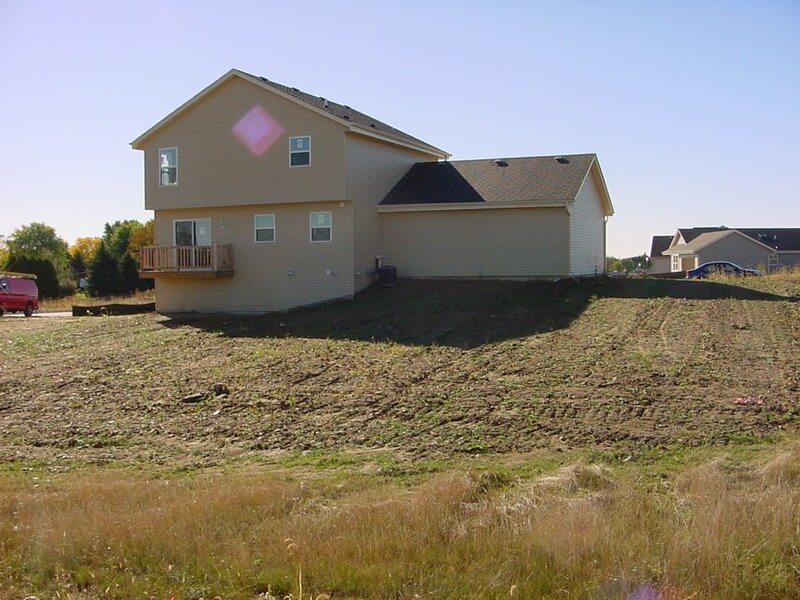 On what was to be one of the final weekends to reasonable find a house without backing out of the sale of our house we had one more acreage to see-literally the last one even remotely in our price range. As we drove up the scenery was very nice-situated on a hill with several out buildings. We toured the location-a retired couple lived there and he had just built new sheds and yes the fully stocked wood shop came with. I was getting really excited. Sure the house needed some work, but we had seen worse. Then we went inside. And it, well it smelled. Of human waste. The septic field was shot to hell. Worse yet the field was down below the house in a wet land-almost gauranteeing issue with the well. I threw in the towel. 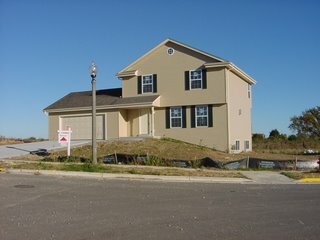 My wife had convinced me that we also needed to start looking into new construction-so we went there next. Suffice it to say that compared to the septic house it was a promised land. 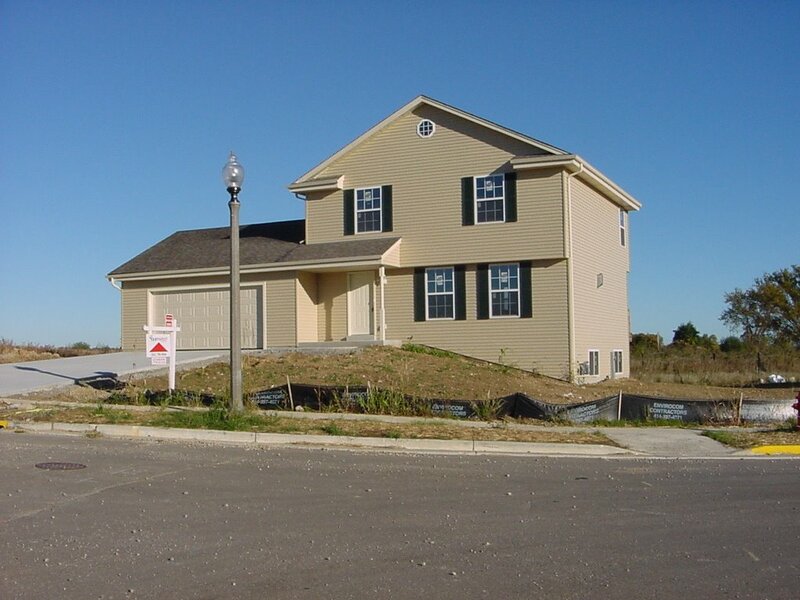 A 1/2 acre lot, and a fully plumbed unfinished basement on top of a 50% bigger floor plan cinched the deal-the only kicker was that it was on the freeway. Not near: ON. Our back fence is literally owned by the DOT. Sorry for the septic tangent, but it is very necessary to see why an organic vegetarian family ends up living on I-94 with all the noise and pollution-though the pollution is much better than in Milwaukee. But now I found myself in a quandary-our house had literally been a farm field a year or so before. We were urban sprawl. Looking back it was this realization that propelled me into Permaculture-I was committed to healing this land-to reducing the impact that we would have. To be better stewards than even the farmer had been. On my 1/2 acre I will succeed. I think I already have. But my 49 neighbors will take some work. For a partime luddite, forming a blog is not something to be taken lightly. The decision was prompted from discussions in the oddest of places-the veggie board of weightwatchers.com . That no doubt warrants some explaining and I will get to it in time. But for now, the rub of the matter-which is this here blog. I am in my early thirties, I live in a subdivision, have 2 beautiful children, a lovely wife, and work for a Fortune 500 Company. So far that describes a significant cross section of the citizens of this country and isn’t worth writing about let alone reading. So let’s spice it up a little-we’re all different and few of us likes to be pigeon-holed-me least of all. I graduated from the University of South Dakota with a BA in Philosophy, specializing-as much as one can in an undergrad- in military ethics for no reason other than that is where my interests took me. I figured a career would find me-and luckily enough it did. 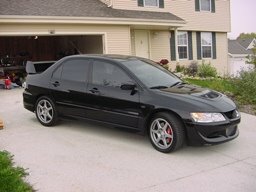 It was there that I became addicted to speed, first in motorcycles, later after attending a SCCA Pro Rally in Houghton, MI it morphed into all wheel drive turbocharged imports. So despite starting a family I sold my practical Jetta Wolfsburg and purchased a well used ’92 Eclipse GSX, dubbed it the Smoke Banshee, and ventured yet again on the quest to prove that PHD toting engineers with million dollar R&D budgets really have no idea what they are doing-and that I can better. So I gutted the interior, modified the turbo, suspension, etc until I could outrace vehicles ten times as expensive. You see I have this particular mania that forces me to leave no stone unturned-I have modified every vehicle I have every owned-every repair is viewed as an opportunity, not to fix-but to improve. As it turns out-this particular arrogance (I prefer confidence) is easily applied to virtually anything-houses, gardens,-but I get ahead of myself. I loved that car as only a nut can-it was my Falcon and virtually every man dreams of being Solo. But then there was that family thing going on. It wasn’t that we needed the space to haul my son around-we had a Forester for that and it fit the bill perfectly. Nor was it money-the Eclipse was dirt cheap and my blood and sweat were free. No- it was that blasted conscious of mine popping up. You see somewhere along the way I had acquired a distinct love of nature-my parents are from good WI farming stock, and I spent my youth fishing and walking the woods with my father. I learned to track deer in the forest preserves of suburban Chicago (not too hard as they are all but tame) and later would count coo on elk, big horn, and bison in Custer State Park in SD. This love was fanned into full blown environmentalism during the courtship of my wife. As a wiccan she saw things differently than I ever had-and I wanted to know what she knew, so as to know her better. Tack on top of this my latent tendency to take things to logical conclusions that had been tempered to a ringing steel in my philosophy lessons and I had serious misgivings about breaking the 400hp mark of my Eclipse. See power takes fuel, and the best catalytic converter in the world can’t make a 400hp rally car green. Was my dream car making the world a better place for my son? Um-no. Hell no infact. So despite having just installed a kevlar racing seat and 4 point harness, I sold it to an aspiring freak from MI, who bought it sight unseen. I love autotrader. Still stinging from the loss, but empowered by doing the Right Thing I went straight to my Honda Dealer and blunked down coin on a blue Civic VP sedan. We looked at a hybrid, but $19k was too rich for our blood and the VP gets 37 mpg every tank no matter what and rated an ULEV. And blue is my son’s favorite color. I kept that car for two years, but it had no soul. I have always, for good or ill, felt that a car says alot about you. As one of the single largest purchases of your life it makes a statement about what you hold dear. And while I switched to the Civic for good reasons-it wasn’t, well… me. So with greater regularity I was searching the web for another race car. See I have few hobbies-rather introverted, fiercely devoted to my wife I spend virtually all my free time at home and don’t regret a minute of it. I don’t golf, loathe television and major sports, and rarely go out for a beer-preferring to read at home. What I hobbies I do have I follow with passion-prior to autoracing it was MTB racing and backpacking. Both those became less practical with my new family, but motorsports was something we could still do together, and my son was pretty good at handing me tools in the garage-good Father Son stuff right? Sounded like rationalizing to me too. Without the racing I had very little outlet and it was eating at me. Recent promotions and my wife reentering the workforce, albeit part-time so one of us could stay home with our now two children had given us some free money. When I saw a black Evolution 8 for $4k under blue book I cracked and did something rash. My son cried for 20 minutes as we drove away from his beloved blue Civic, but I had my dream car. 300hp, carbon fiber aerodynamics, and a suspension that will literally out handle some Ferrari’s and it was mine. For a time. Until now I had been able to meet or beat the EPA on virtually every car I had owned. Even the Banshee could be over 30mpg if I stayed off the turbo and the Forester was good for 31 mpg on the trips to the inlaws in SD. The EPA says the Evo can do 27ish. Even driving it like my Civic I only ever saw 22mpg-and when I was racing or testing out new settings it got down to the low teens. Driven daily, as it was, I was seeing 19-20. That meant filling up weekly with premium. Combined with gas at/over the $3 mark this was all but eliminating my annual budget for modifications and race fees. Tacked onto that the rising natural gas prices and our monthly budget was losing its wiggle room. This past January we did a 3,5, & 10 year budget-something we started doing when we had kids. That extra money wasn’t just taking the mods away from the Evo-it was making the chance of taking the kids to Glacier next year doubtful, and the dream of us buying a 3-5 acre plot in 3 years almost impossible. My dream had become the family’s dream. Then there was my little 4 year old conscious. We have raised our son to hold hold certain things dear, but to make his own decisions as much as a 4 yr old can. When he asks why some people drive Big Trucks-we explain that they may need to tow heavy trailers, etc. or maybe they just like to have a big vehicle. When asked why we drove a Forester (our 3rd…) instead, we explained that we didn’t need to tow anything big-and that all four of us fit in just fine. Anything bigger would be wasteful. This was becoming a theme in our teaching-fitting in with why our house isn’t as warm as our friends, why we don’t eat meat, and why Daddy’s lawn mover has no engine. So when my son asked me is the Evo was wasteful it hit home. How do you explain compromises to a 4 year old? I tried, but it was weak and we both knew it. The seed was planted-and given the long term budget situation it fell on fertile ground. 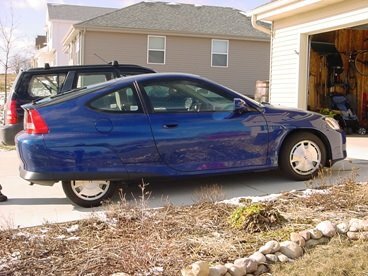 Within a month of our budget work-really only 2 weeks- I was haggling over the phone with Honda Motowerks in LaCrosse WI on a 2001 Insight Hybrid. Impulsive? Heck yeah, but so was buying the dang Evo in the first place. The reasoning being that the Insight had soul-it was quirky enough for me, and had enough cutting edge junk stuffed into it to make the Evo seem archaic. Add into it that it is the most fuel efficient car sold in this country and I was All In. The Pod came home this February-Blue, 58,000 miles and a lifetime mileage a respectable (my how perspective changes!) 58.9mpg. As importantly-the move is saving over 10,000 lbs of CO2 annually-I had a quantifiable impact on my impact. To date my best one way commute mileage is an astounding 80.6 over 19 miles, and I see mid sixtites on every tank. Loves it. However, it has always been the dichotomy that I have loved about me. The SCCA Eco Freak doesn’t fit into a pigeon hole. The discussions at work revolved around how the Evo had kept me sane-kept me safely back from The Edge. With the Evo gone-where was the anchor in the Real World? I remember a discussion with my wife on the way home from the dealership-something about asking her to look back over our shoulders. See That? It was The Edge and this car just drop kicked us off it. Sure is cute though. I am interested to see where the plunge takes me-and look forward to sharing the trip with you.